Providing an uninterrupted power supply, for the population to attend their day-to-day needs, for industrialists and investors to engage in their industries and for the smooth functioning of businesses and other essential service is the responsibility of any government. Though considered a luxury in the bygone era it has now become a basic need of any human and cannot be compromised by any responsible government. The Lakvijaya power plant at Norochcholai. For Sri Lankans the politics of 'power' is not an unusual phenomena as they have experienced the way politicians used the 'power' tool to topple governments and also brought disrepute to governments in power. In 'power' politics, Norochcholai, has always been a hot topic. When Sri Lanka was striving to strike deal on coal fired power plant, the cheapest source of generating power to meet the increasing power demand in the country, Norochcholai coal fired plant automatically included into that dialogue on power. There was a tug-of-war between the governments and the common masses who were genuinely protested due to their concerns over the Norochchcolai power plant or else influenced by politicians in late 1990s about the project that wast to be implemented to facilitate healthy economic growth in the country. But the politicians of that era could not overcome those obstacles to clear the path for the implementation of the much needed coal fired power plant of the country. They succumbed to the pressures of the masses who protested against the project may be due to sheer ignorance of the future situation of the country or may be due to the influence of narrow minded politicians, without going ahead with the project. However, the project which was in need of urgent implementation became reality only after President Mahinda Rajapaksa came into power in 2005 daring to take the much urgent policy decisions to go ahead with project. Yet, even after the commissioning of Norochcholai coal fired power plant adding 300 MW of power to the national grid and boosting the power generation capacity of the country into 3400 MW, Norochcholai power plant has not relieved from the power politics of the country. From the date of commissioning in mid 2011, it became a constant topic of the media, as any failure of that power plant has been highlighted in the media thus making it a point for the politicians to play sixes in an open ground. But the extent of criticism over the project has increased in many folds with the temporary shut down of the power plant due to technical deficits reported recently. 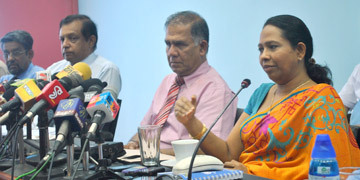 According to Power and Energy Minister Pavithra Wanniarachchi who explained the real situation behind the Norochcholai coal fired power plant to media last Thursday, the power plant has become a cynosure of the media as it is the one and only coal fired power stations in the country. "As a responsible government we can assure the people that there will be no power cuts and tariff revises in electricity bills owing to the situation, because we are in possession of enough power stations to meet the peak hour electricity demand of the country", she assured. 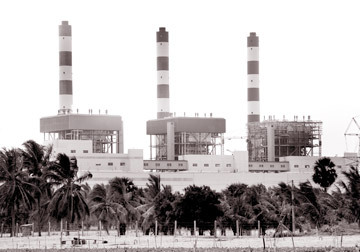 According to Power and Energy Ministry and Ceylon Electricity Board officials three power stations, the Norochcholai coal fired power plant (300 MW) combined cycle power plant at Kelanitissa (55 MW) and Randenigala hydro power stations are not functioning at present due to deficits reported in the power stations. "A leak in the condenser has resulted in the shut down of the Norochcholai power plant and we are trying our best to find a permanent solution for the failures of this power plant which generate power through a highly complex technical process," the Minister said. The China Machinery Engineering Corporation (CMEC) during the discussions held on Friday with the Power and Energy Minister Pavithra Wanniarachchi and the Ministry officials said that steps would be taken by the company to resume the operation of Norochcholai coal power plant. The officials of the CMEC stressed that all arrangements are in place to resume the operation of the power plant soon. Chairman of CMEC Zhang Chun told the Minister that the entire power plant would be brought under thorough inspection by the Chinese and Sri Lankan engineers. He said that experts in the fields would be brought to the country for the resumption of operation in the power plant. CMEC chairman Zhang Chun said that they hope to carry out the repairs in the power plant after conducting thorough examination of the plant. "All efforts are taken to resume the operation of the plant", Zhang Chun said. She said she had indicated to Chinese Embassy officials who met her this week that the Chinese Government must also share some responsibility for the issues at Norochcholai as the CMEC was recommended by the Chinese Government. "They should also share the responsibility of it as the failure of the plant reflects badly on the Chinese Government itself," she said. "What we need now is to have a power plant equivalent to the cost we paid and have a permanent solutions for the failures reported in the power plant," the Minister said. "I believe that anywhere in the world if any country is having power plants which generate power through complex technical processes, there are possibilities to experience technical failures. That is why they are having more and more power houses which can generate power at low cost," she said. The Minister pointed out that though some people are talking about the losses incurred due to the failure of the power plant they are not talking about the benefit the country gained through the implementation of this project after failing to implement a coal fired power plant for 30 years by successive governments since 1982. "They do not aware that since the commissioning of the power plant the CEB has been able to recover the cost incurred in the project and also earn another Rs.10 billion in excess when compared to the Rs.7 generation cost per unit at the Norochcholai power plant and the Rs. 25 generation cost per unit when generating power at other thermal power plants," she said. "From the day I assumed duties as the Power and Energy Minister we have taken initiatives to start Sampur coal fired power plant with Indian assistance on the instructions of President Mahinda Rajapaksa and are in discussion to launch another coal fired power plant with the assistance of the Japanese government in addition to the implementation of the Broadland hydropower station," the Minister said. Secretary to the Ministry of Power and Energy, M.M.C. Ferdinando said that the frequent breakdowns at Norochcholai are now under investigation as it need to be rectified permanently. "Those frequent failures may be due to, the use of substandard machinery and parts at the plant, lapses or human failures on the part of the engineers and technicians who worked on the plant or due to the design flaws. These three possibilities are now under investigation," he said. "There is no need to hide the financial losses the CEB incurred due to the breakdown of the power plant as it generated power at low cost. But compared to the financial losses the CEB came across in the past the CEB benefited much from that project due to its low cost power generation," Fernando said. He said since July 2011, 4.8 billion units of electricity have been generate from this plant and the benefit of the project can be estimated by calculating the amount the CEB has to pay for the thermal power generation by spending minimum Rs.25 per unit compared to the Rs.7 generation cost per unit from the Norochcholai power plant. He said though there are reports about the second phase of the project also it has not yet reached the commissioning stage. "We are still in the process of evaluating the parts of the plant that are been assembled in accordance with the technical standards. Then only it will be used for commercial operations," he said. He said that the CEB has to delay the commissioning and commercial operation of the second phases of the project as they want assurance that there wont be technical failures in those plants also. "We are determined to go through the entire process of checking the plant by having testing runs and reliability tests of the second phase of the power plant before connecting it to the national grid, because we connected the first phase of the project without subjecting it to the reliability testing," Ferdinando said. He said that they will not allow the Chinese company that built the plant, to deviate from their responsibilities if it is determined that deficiencies on their part had contributed to the breakdowns. However he said they have also committed to look into the situation even though the guarantee period of the power plant has already been lapsed. "They have assured that this will be rectified without incurring any additional cost to the Government. We are also expecting to get this power plant repaired as soon as possible," he said. The Secretary also refuted the allegations that these power plants are intentionally damaged so that the private sector power plants can sell their power to the CEB. "There is no truth in those allegations and we are in the process of reducing those agreements to purchase power from the private sector at higher cost with the commissioning of the second and third phases of the Norochcholai power plant," Ferdinando said.